Okay, many of us are looking to get that edge in the Battle of the Neighborhood Gardens. Many MORE of us are looking to do as little as possible to win the ‘appearances’ portion of the Neighborhood Garden Battle. I introduce you to… straw bale gardening. Similar to container gardening, but without the container. What is actually happening here is that the container is actually the straw bale itself, held together with two or three pieces of twine. There’s some science involved because of the amount (or lack) of oxygen that reaches the bale’s inner straw – but you don’t need to worry about that. Just know that it works, and it’s awesome. Talk about plug ‘n play! The inner straw becomes a “conditioned” compost – so with water and sun, it works like a beauty. Big bonus here: you don’t have to be one of these ‘green thumb’ types, either. Can you operate a water hose? 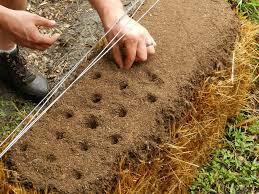 Then you can do straw bale gardening. What I really like about it – beyond the ease – is that I think it looks really cool. And the options are (really) endless. I’d like to imagine someone with a lot of creativity doing interesting patterns with the straw bales (like wiggly lines or something), mixing colors of their plants for something really interesting. In my one serious paragraph here – if you’re showing your home, this stuff is DYNAMITE!!! FAST, EASY, AND IT LOOKS GOOD. Can’t beat it if you’re looking for a quick way to give your garden a really attractive bump for a prospective buyer.